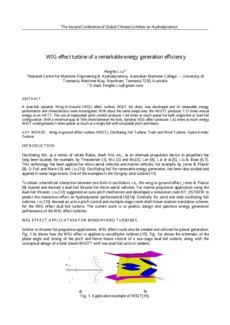 A dual-foil dynamic Wing-In-Ground (WIG) effect turbine, WIGT for short, was developed and its renewable energy performance and characteristics were investigated. With about the same swept area, the WIGTT produces 1.73 times annual energy as an HATT. The use of trapezoidal pitch control produces 1.44 times as much power for both single-foil or dual-foil configuration. With a minimum gap of 16% chord between the foils, dynamic WIG effect produces 1.42 times as much energy. WIGT could generate 5 times power as much as a single foil with sinusoidal pitch and heave.